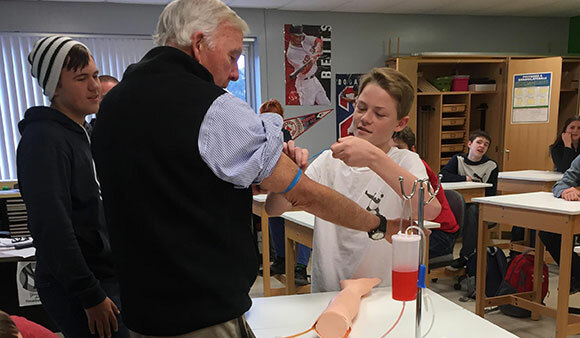 CROWN POINT | One of the first things students want to hear about when Dr. John Fortune walks into their classroom is his most shocking cases as a trauma surgeon. By the end of class, all they want to hear about is the high-quality jobs in health care he came to tell them how to access. Fortune, a professor of surgery at University of Vermont’s Larner College of Medicine, has been traversing the North Country with his interactive presentation during the 2018-19 school year as part of a STEM/health care careers program sponsored by the Brooks and Joan Fortune Family Foundation in conjunction with CFES Brilliant Pathways. Fortune’s current work with CFES — a global nonprofit that has helped more than 100,000 students become college and career ready — allows him to focus on the aspect of his 35-year career as a professor, researcher and renowned trauma surgeon that he cherishes most: educating young people. One of Fortune’s main goals is to ensure that students are aware of the jobs in health care that are rising along with America’s aging population. It is estimated that demand for nurses alone will rise from 16 million to 22.5 million by 2025, the press release said. Fortune tells students about the education required to access jobs and then shows them specific tasks performed by medical professionals such as how to measure oxygen saturation and heart rates like a nurse; draw blood from a surgical mannequin arm like a phlebotomist; and tie a suture like an emergency room doctor or surgeon. “We want to let students know that they don’t necessarily have to go to college for four, six or even eight years to get all of the benefits of a career in health care,” said Elaine Dixon-Cross, director of Programs and Initiatives with CFES and a former principal at Crown Point Central.